Some people call it “accounting.” Some call it “bookkeeping.” Whatever you call it, we’ve created a way for you to get the job done – no technical knowledge or training required. When you look at a line in your bank statement, are you able to say: “I remember this purchase at Office Depot: I bought office supplies, and I paid by credit card”? If so, then you have what it takes to do your accounting/bookkeeping in Wave. The core task is what we call “categorizing your transactions.” You categorize transactions anytime money comes into your business (i.e., you get paid), or money goes out (you buy something), or money moves around between accounts (you transfer money from checking to savings). Easy-peasy. You do all of this on your Transactions page which is located under the Accounting heading on the left-hand menu. Get the transaction into Wave; there are automatic ways of doing that (more on that later), and manual ways. Indicate the category of the transaction (e.g., that Office Depot expense was for Office Supplies). Apply a sales tax if applicable. Click the “Verify” button to show that you’re done. Do just this, for each of your transactions, and your accounting/bookkeeping work is complete! The “Connect a bank account” tab. The “Upload a bank statement” tab. The “Filter by transaction type” list. The “Filter by category” list. The “Filter by account” list. The “Filter by date” tab. Click the “Mark as Reviewed” button to show that you’re done. The “Accounts” filter. Here you can change which account transactions you wish to see in the list. The “Add Income” button. Create new deposit transactions using this button. The "Add Expense" button. Create new withdrawal transactions by clicking here. The “Add Journal Transaction” button. Use this when you need to create more complex Credit/Debit entries. The “Connect Your Bank” button. The “Upload a Bank Statement”. The “Mark as Reviewed” button. The “Category” tab. Use this to categorize your transactions. 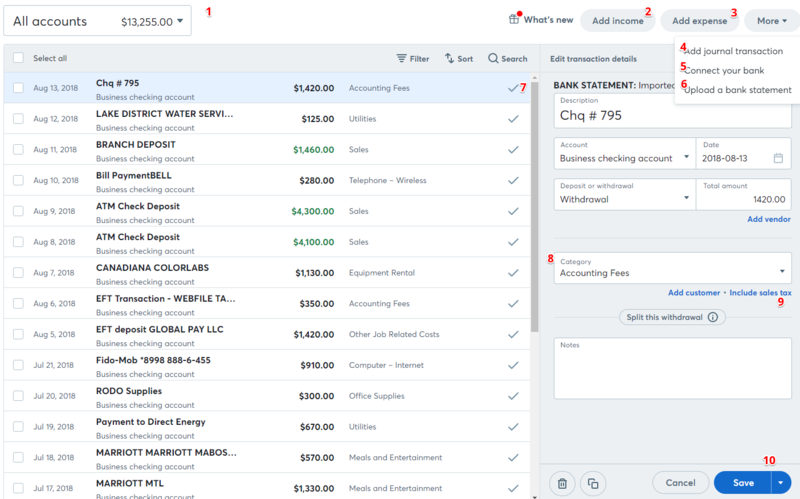 An easy way to get your financial records into Wave is to connect your bank and credit card accounts. This will import your transactions into your account automatically. To provide you with the highest level of security, we partner with a specialized service used by banks themselves. The connection process uses state-of-the-art security measures and encryption to keep your information safe. Your bank credentials are stored in ultra-secure systems by our bank data partner. The connection Wave makes is a read-only connection. This connection can’t be used to move money into or out of your account. From your Transactions page, click Connect a Bank Account. Search for/select your bank, credit union, credit card or other financial institution. Enter your login credentials and Connect. Wave will connect with your financial institution, verify the security credentials, and retrieve account information. This process can take a few minutes — this is a good time to grab a cup of coffee. Wave lists all the accounts that are available to connect. If you don’t want to connect a specific account, slide the switch next to this account to Off. 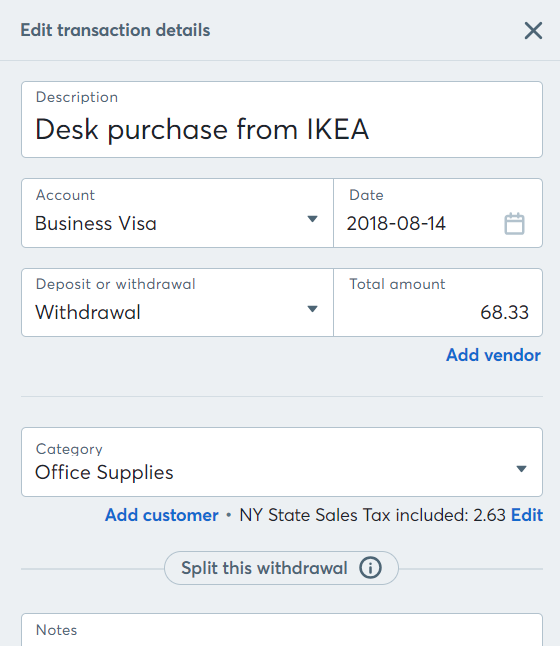 “Importing transactions into”: Indicate whether this specific account is for your business, or if it’s for your personal finances. If you use it for both, go with the account’s primary purpose. “Start importing transactions…”: By default, Wave will try to get transactions from as long ago as we can. Most financial institutions restrict this to a range of about 1 to 3 months. If you only want transactions from this year, or starting 2 weeks ago, or from a different range, you can specify it here. Now Wave imports the transactions you asked for, and puts them in the place you've assigned. From your Transactions page, click the arrow next to Add Transaction, then Connect a Bank Account. 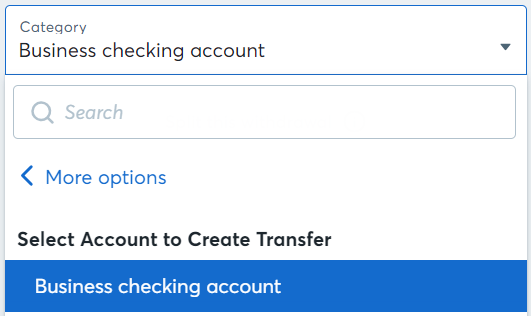 If your bank isn’t one Wave can connect to, if you have older transactions (more than 30 to 60 days old) you'd like to see in Wave, or if you prefer not to connect, you have two options: you can upload your statements into Wave (this is still really quick! ), or enter the transactions manually. On your Transactions page, click Upload a Bank Statement. Choose the statement you downloaded from your financial institution, and indicate the Payment Account, or click the + symbol to create a new Payment account. 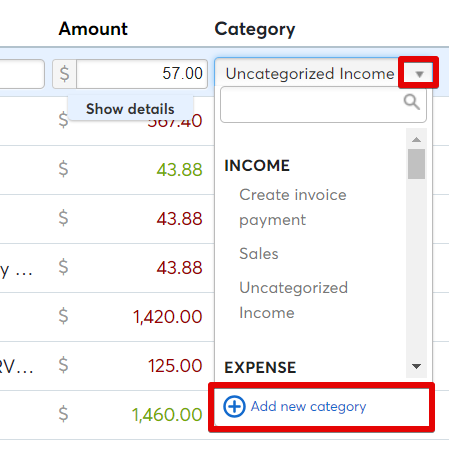 On your Transactions page, click Add Income or Add Expense. Enter the details of your transaction in the spaces provided. 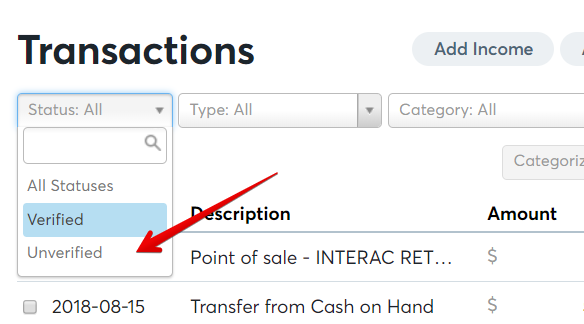 On your Transactions page, click the arrow next to Add Transaction, then Upload a Bank Statement. On your Transactions page, click Add Transaction. From the Transactions page, click on any transaction. In the Category column, select the correct categoryfromthedropdown menu. Don’t see the category you need? Click the Add new category option. It really is that easy! Just click outside the transaction and your information will save automatically. You move money from your checking account to your savings (or vice versa). You record a cash payment in Wave, and then deposit the cash to your savings account. You make a payment on your credit card bill, using money from your checking account. If you have your bank and credit card accounts connected to Wave, a transfer will usually reveal itself by showing you two different line items for the same thing. So how do you categorize them? You don’t. You mark them as a transfer. Let’s use the simplest example: You move $50 from your checking account to your savings account. 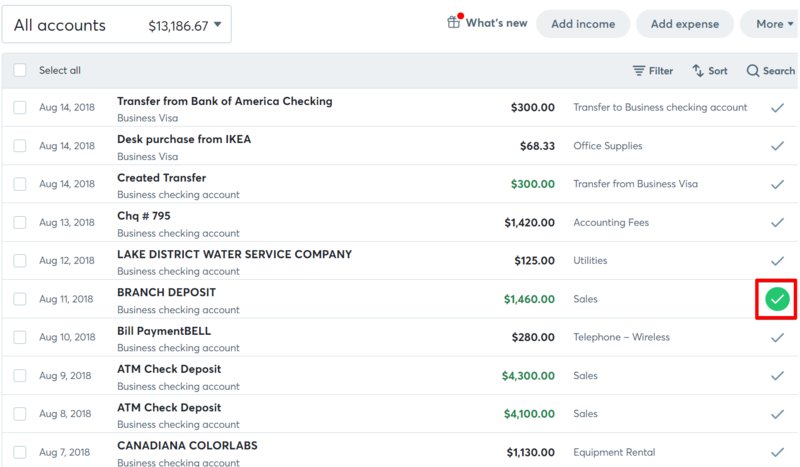 If both accounts are connected to Wave, you’ll see one line with $50 coming out of your checking account, and another line with $50 going into your savings. On your Transactions page, find the two transactions. 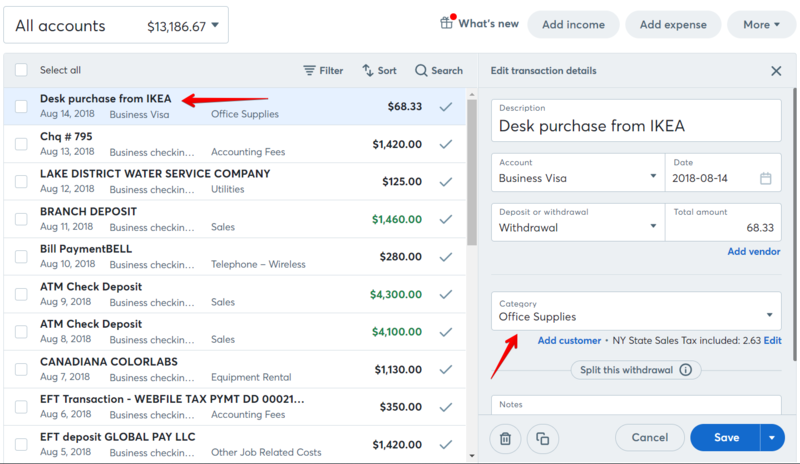 Instead of trying to categorize them, click the boxes on the left-hand side of each line item, to select the two transactions. Now, up top, click the Transfer button. The transactions will be renamed as “Transfer from...” and “Transfer to...”; so will the Category. Verify the transactions now by clicking the check box on the right side. These two transactions have now been matched as a Transfer, and all the underlying accounting stuff is correct. You’re done! In the Category tab, select (or search) the correct category from the drop-down menu. Don't see the category you need? Head over to Chart of Accounts page in the left nagivation menu and add a new one. It really is that easy! Just click on Save once you're done editing the transaction details. If you have your bank and credit card accounts connected to Wave, a transfer will usually reveal itself by showing you two different line items for the same thing. So how do you categorize them? You simply select Transfer to bank, credit card, or loan from the Categorization menu. Our system will look for the matching transaction, which you then want to click and Save the changes. On your Transactions page, find one of these transactions and click on it. Select the drop-down under Category, then Click Transfer to bank, credit card, or loan and click on the transaction matching the other side of this tranfer. The transactions will now be linked together as a Transfer. Mark the transactions as Reviewed now by clicking the check box on the right side. If you collect sales taxes on the products or services you sell, and pay sales tax on the things you buy, you can indicate that on your transactions. Click in the “Taxes” box, then click Add new tax. Fill in the fields regarding your sales tax. Make sure the Tax rate (%) is correct! All the tax calculations will use the number you put in. IMPORTANT: You’ll indicate whether the tax is recoverable or not. This cannot be changed later. Click the Add tax button to save. 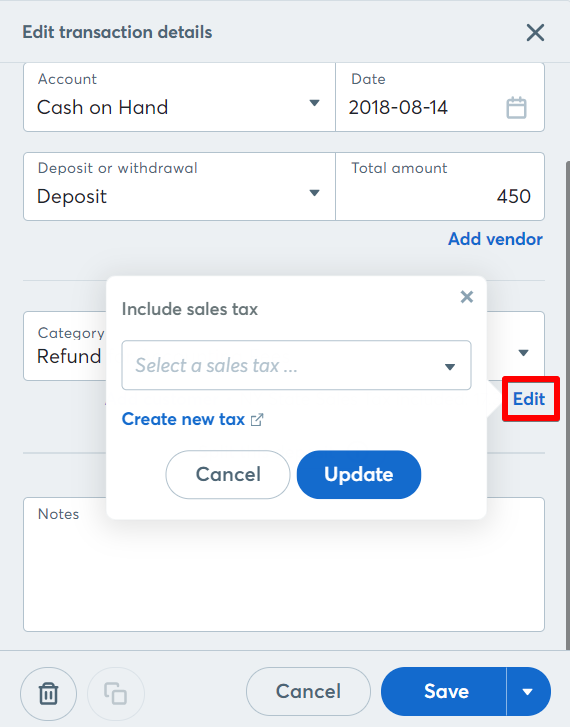 This tax will now be available in the drop-down menu for all future transactions.Click outside the transaction, and your information will save automatically. See the check mark at the far right side of each transaction? Click it. When it turns green, that transaction is verified. Verifying is like ticking something off your To Do list. Your goal is to end up with no unverified transactions. Here’s how it works. Refresh your browser window once in a while, and you’ll see that the Verified transactions disappear from your filtered view. Keep doing this until there’s nothing left. When you have no more Unverified transactions, your work is done! Congratulations. If you collect sales taxes on the products or services you sell, and pay sales tax on the things you buy, you can indicate that on your transactions. If you haven't yet created a Sales Tax, complete the steps indicated here. Click on Include Sales Tax under the Category tab and select the tax appropriate for this transaction. Click Save and the tax will be applied to the transaction. Please note: Tax calculation on the transactions page is inclusive; any sales tax that is added will be included in the transaction total. Wave will provide the amount breakdown under the tax button. See the check mark at the far right side of each transaction? Click it. When it turns green, that transaction is marked as reviewed. Reviewing is like ticking something off your To Do list. Your goal is to end up with no unreviewed transactions. Click "Help" from the bottom left of your Wave account to access our extensive FAQs. Ask us! If it’s a question about how to use Wave, we can get you the answers you need. You can check out our Community, as well!